The thing Ayer is really terrific at is creating a palpable sense of time and place; usually it’s an unsafe, precarious one where things can explode at any moment and we worry about the characters’ well-being minute by minute. In End Of Watch it was the gang-riddled suburbs of LA, in Fury it’s the Allied occupation of Germany during the last few days of World War 2, at a time where the country and continent have already been battered and torn, and the people dragged through the dirt. When we meet the crew of Fury, the eponymous tank led by Don “Wardaddy” Collier (Pitt), we genuinely believe they’ve already been through hell – and they only made it by drawing strength from each other. After the opening five minutes of discussion and banter, we struggle to see exactly where this story is yet to go, which only further strengthens the comparisons to End Of Watch (which never really stop) as it becomes clear from the outset that this is less about war and more about brotherhood and camaraderie. The film is perhaps a bit too aware of conventions, of what it thinks a war film should be, as certain contrivances get in the way of spectacle and story. Norman’s (Lerman) development proves to be the most problematic, as the young, scared, unwilling to kill pencil-pusher thrust into the bowels of a tank as the war draws to a desperate close suddenly turns into a stone-cold Nazi killer in the space of minutes. The midway exposé over fried eggs is a clear turning point for his character, and several others, but, while the scene is particularly excellent, it’s awfully blatant in the way it’s trying to set up the third act. Yet in the grand scheme of things it doesn’t present too much of a problem. We have to just accept the fact that it’s going for an un-glamorous, stripped-down view of war; it’s not overly worried about the intricacies of dramatic structure. The combination of wonderfully grimy cinematography, quality costume design and solid performances helps to maintain the sombre atmosphere throughout, so important to how well the film works. Said performances, while none are particularly standout, work really well as a unit. Brad Pitt is sort of channelling a moodier Aldo Raine, while Shia LaBeouf is the most noticeable of the lot. He continues to live an odd social life while his performances continue to excel. See the upcoming Charlie Countryman for further evidence – a terrific performance. 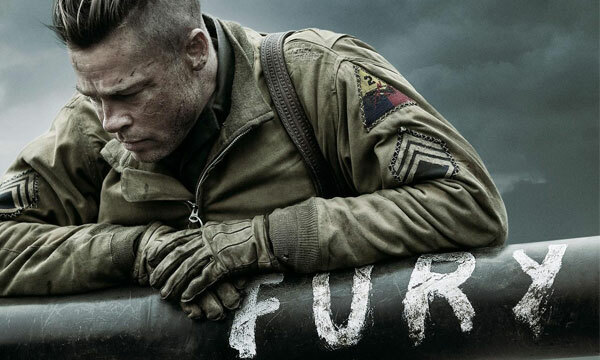 Fury is neither glamorous nor spectacular, but it’s a well made and well performed story about the realities of war and the bond between soldiers. The sequences inside the tank are impressively claustrophobic, the action is engaging, brutal and intense, with that same Shakespearian tragedy thing that End Of Watch had going on, where we can never quite shake that feeling of foreboding every time the characters get into a jam, and the religious discussion throughout, offset by a rather haunting satanic soundtrack, provides an interesting background commentary. This is solid, engaging cinema that, to much relief, proves Ayer isn’t just a one trick pony.